How good is the new kit zoom for Panasonic's new S1 and S1R full-frame mirrorless cameras? The Panasonic S 24-105mm f/4 Macro OIS makes a good standard zoom for a Lumix S1 or S1R body. It's pretty big and heavy, but so is the Lumix S itself, so they feel like a good physical match. Optical quality is good for a lens with this kind of range, though not the best we've tried. Add to that its slight price premium over comparable lenses for the Sony FE and Canon EOS R system, and this comes across as a decent lens enough lens for the money, but nothing out of the ordinary. The Panasonic S 24-105mm f/4 is one of three lenses that Panasonic has so far introduced for its Lumix S1R and Lumix S1 full-frame mirrorless cameras – and it is this zoom that you are most like to buy with the body. But just how good is the lens – and is it a good match for the high-resolution 47-megapixel sensor on the S1R? The 24-105mm focal range is handy to have in a standard zoom lens, giving you significantly more reach than a 24-70mm. The downside is the more restricted f/4 maximum aperture (as opposed to a 24-70mm f/2.8) and the size and weight. The Panasonic S 24-105mm f/4 Macro OIS does have a couple of interesting features, though. One is its in-built optical stabilisation, which works alongside the in-body stabilisation in the Lumix S bodies to provide up to 6 stops of shake compensation (quoted with the lens at its 105mm maximum focal length). The other is its 'macro' mode. With the lens's very short 0.3m minimum focus distance, this gives a maximum 0.5x magnification, which isn't the same as a true 1:1 macro lens, but still enough to produce pretty striking close-ups. These two features make the Panasonic S 24-105mm f/4 Macro OIS handy for both low-light photography and close-ups, extending its everyday usefulness. This lens also uses linear AF motor technology for fast, silent autofocus and Panasonic claims a minimum focus acquisition time of just 0.08sec (at a light level of 11EV and at the lens's shortest focal length). Panasonic is using its own DFD contrast based autofocus system rather than technically faster phase-detection AF, but with 480fps AF control to deliver competitive AF response. Panasonic's DFD autofocus system is certainly quick and responsive. Fast AF times depend just as much on the lens's AF actuators as the camera's own AF system, and here the two work brilliantly together. If it wasn't for the size and weight of the S1R/24-105mm combination, the autofocus response would make you think you were handling an APS-C or MFT camera rather than a full frame mirrorless model. For speed and responsiveness, the Panasonic S 24-105mm f/4 Macro OIS feels like a good match for rival mirrorless 24-105mm lenses from Sony and Canon. Our sample images look good too. The lab results suggest this is a competent lens rather than a stellar one, but in real-world shooting there's little to complain about. The edge definition never quite matches up to the resolution in the centre of the frame, but in-camera corrections take care of any barrel or pincushion distortion, together with the slight chromatic aberration (colour fringing) shown up in our lab tests. This feels a weighty lens to use, but the controls, zoom ring and other switchgear feel firm, positive and well made. We didn't quite match the claimed 6-stop shake compensation claimed by Panasonic, but these figures are typically obtained in test conditions, whereas in our real-world handheld testing we achieved something like a 4-stop gain – which is pretty good compared to other systems. Shot with the Panasonic S 24-105mm f/4 Macro OIS and Panasonic S1R, with little or no pincusion distortion at full zoom and good levels of contrast. The lab results show some barrel distortion at 24mm, but this appears to be corrected effectively in-camera. A combination of close focusing, maximum aperture and a full frame sensor is a recipe for vanishingly small depth of field! Wide open at f/4, the depth of field is so shallow that you need the camera's pinpoint focus mode to be sure of getting the plane of focus exactly right. We use Imatest lab charts and analysis software to generate resolution data for our lens tests. The results are based on the MFT50 threshold for contrast, to eliminate any observer bias in looking at test charts visually. We measure sharpness both at the centre of the image frame and right in the corners. It's common for cheaper lenses (and long zoom types) to lose sharpness at the edges, and we also expect to see performance drop off at wider lens apertures. Here, the centre-frame sharpness is very respectable for a zoom lens, as we'd usually expect scores of 2500+ lw/ph only from a well-designed prime lens rather . than a general-purpose zoom. Only at f/16 does sharpness drop off noticeably. The corner sharpness, however, is average at best throughout the lens's focal range – it's a somewhat disappointing performance for a lens of this calibre (and cost). The lens produces noticeable barrel distortion at 24mm, though it's nothing severe and by 50mm the lens is essentially distortion-free, and stays so right to 105mm. We test 'uncorrected' raw images, however, and it's now common for mirrorless camera makers to embed correction profiles directly into raw files, so you may not see any distortion at all in your own images – we didn't in our real-world test shots. Fringing is apparent at the edges of frame at all focal lengths, but it's to be expected for a zoom lens with this focal range and, again, the test was carried out on uncorrected raw images. Aberrations are not particularly noticeable in real-world shooting, and most premium-quality raw processing programs now include automatic lens correction profiles (or support embedded correction data). 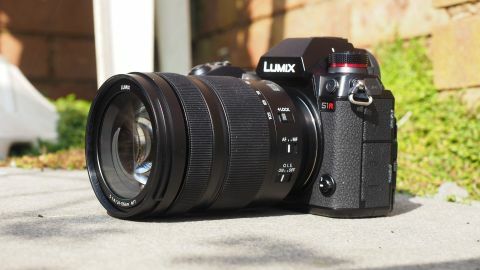 The fact is, of course, that if you've invested in the Lumix S system your choice of lenses is currently quite limited anyway, and this Panasonic S 24-105mm f/4 Macro OIS is the obvious candidate as a standard zoom lens for these cameras – and you're unlikely to be disappointed by it. On the other hand, its performance is solid but unremarkable, so it's no reason to buy into the Lumix S system on its own.